How do I use Automation Rules? Here are just a few situations where automation rules can apply. Automatically assign your customers to a special autoresponder email campaign when their orders reach a pre-defined amount. For example, single orders totaling over $500 can automatically be assigned special follow-up emails after the order is shipped. These autoresponder messages can range anywhere from special thank you notes thanking them for their business or even special promotions and coupons to encourage them to purchase more! Automatically place customers into a special pricing group when they order a specific product. For example, a gold membership card that gives them access to a preferred members pricing group. When the order for this product is fulfilled, your automation rules automatically assign the customer to your predefined group. Flag specific orders with a color designation within your 3dcart order manager so that they're easier to see. For instance, an order that is placed by a member of specific customer group can automatically be flagged in a red color to help you identify these orders more quickly in the order manger. Send an automated email for registrants when they sign up for a specific customer group. The automation rule will trigger tasks based on paramaters you specify when orders come in. The automation rule will trigger an autoresponder campaign when customers register for any particular customer group you specify. After selecting the type of rule in step 5 above, click "Save"
After clicking "Save" you will be taken to the Automation Rule you've just created so you may begin specifying its parameters. Specify your automation rule settings as needed, followed by your automation tasks. When complete, be sure to ENABLE the Automation Rule by clicking the provided button at the top. The following will illustrate the individual options available when creating your automation rules and tasks. If you are creating an Automation Rule for an autoresponder campaign; please be sure to have the campaign created, populated with email messages and ready for use before assigning a rule for it. The same will apply to automation rules for Custoemr Registration since an autoreposnder campaign is the only option allowed for these types of rules. When creating your Automation Rules, you will have the following settings available. This section will contain two specific portions; Automation Rules & Automation Tasks. These will be the parameters the order must meet in order to apply for the automation. This is the specific name of your rule. You may change it as needed. The first half of this page will contain the actual Rules you need to specify. Orders must meet the requirements set in this section in order to trigger the tasks specified in the second half. When an order is placed by a member of this customer group, the automation will be triggered. the automation will be triggered. Orders within this range will initiate automation. Here you can select up to five items that - when purchased - will trigger the automation task. When creation an automation rule for Customer Registration, select which customer group will trigger the rule. When using the products trigger function, if multiple items are selected, those multiple items will need to be present in the cart in order for the automation task to trigger. In other words if you create the automation rule for three items in the products list, those three items will need to be in the order. These will be the individual actions that will get applied to the orders when the rules are met. Orders meeting the above rules will have their email addresses added to this autoresponder. This will also be the option available when creating a "Customer Registration" rule type. Users placing orders that meet the above rules will have their accounts moved to this tasks customer group. Orders meeting the above rules will be flagged with a specific color in the 3dcart order manager. 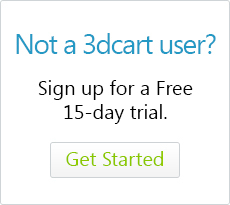 Orders meeting the above rules will be moved to a specific status in the 3dcart Online Store Manager. You can create an unlimited amount of automation rules for your store. After creating the automation rules, you can view and edit them simply by navigating to your Automation Rules page in the Store Modules section.